Life Is In Their Hands - Death Is On Their Minds! With 1957�s 12 Angry Men, we look at an unusual kind of drama � one set almost entirely in a single room. We view a jury as they go to deliberate a murder case. If they find the defendant (John Savoca) guilty, they condemn him to death, since that�s the only punishment applicable in this situation. For 11 of the jurors, this seems to be an open and shut case. They quickly decide that the kid did the nasty deed and should be found guilty. However, Juror #8 (Henry Fonda) takes the judge�s (Rudy Bond) instructions to heart. He thinks there�s a reasonable doubt about the kid�s guilt and argues this line. Since the verdict must be unanimous, this creates many arguments. The movie follows the tensions as the 12 jurors deliberate over the case. 50 years after its release, Men remains influential and impressive, though it does show its age at times. Adapted from a 1954 live TV production, the framework that binds the characters to the single room acts as both a strength and a weakness, though the positive elements dominate. I think the setting increases the tension inherent in the story, as the tightness and claustrophobia prevent too many opportunities for release. Even when the characters take a short break from deliberations, they still get stuck with each other in the confined space. They can�t escape each other for more than a couple minutes at a time, and that amps up the tension. On a negative note, though, I think the setting requires director Sidney Lumet to adopt a few showy bits that don�t seem very natural. For instance, when Juror #10 (Ed Begley) releases all of his racial hostility, the others slowly leave the table and put their backs to him. Yeah, we get the point; this scene beats us over the head with their body language. It doesn�t feel realistic to me, as it comes across like something very staged. Actually, the racial aspects of Men display its most substantial weakness, and I don�t mean that because all the cast members are white men. Men emerged right as the civil rights movement started to blossom, and it often feels like a product of that era. We get periodic speeches intended to remind us that all men are equal and blah blah blah. Of course, I agree with these, but they seem dated 50 years later, and the film doesn�t integrate them in a smooth way. They always feel just a little too forced. These are small quibbles I aim at an otherwise strong film, though. Men boasts a simply outstanding cast and conveys its story in an economical manner. We don�t get clumsy exposition for the characters. We learn a little about them in general terms, but the flick doesn�t pound us with those beats. Instead, we simply get a taste for each personality, and the actors make them into real characters. We know almost no specifics about the backgrounds of these men � heck, we don�t even learn any of their names until the final shot � but the movie tells us everything we know if a smooth, subtle way. Lumet also uses the camera well most of the time. Sure, we find some awkward shots like the ones I mentioned earlier, but usually Lumet ensures that the camera acts as a storytelling device. For instance, when confrontational scenes occur, the camera tends to go in for a tight close-up. It relaxes when the sequence dictates. This doesn�t happen in a ham-fisted and obvious way, however. The visual choices mesh with the story and make it more effective. All of these factors combine to make a satisfying film. 12 Angry Men occasionally slips, but never for long. Instead, it manages to provide a bright, involving drama. 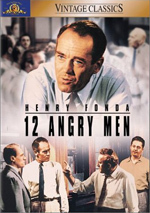 12 Angry Men appears in an aspect ratio of approximately 1.66:1 on this single-sided, single-layered DVD; the image has NOT been enhanced for 16X9 televisions. That�s one problem with the presentation but not the only one, as a mix of concerns popped up here. Despite the absence of anamorphic enhancement, sharpness usually seemed decent. Wider shots came across as soft and ill-defined, but these weren�t overwhelming. Though the flick could�ve been tighter, it still seemed acceptable in that regard, at least in terms of the closer images. I noticed no real issues with jagged edges or shimmering, though I detected light edge enhancement through the film. Blacks were a little muddy at times, but they usually seemed pretty deep and firm. Shadows followed suit, as the low-light shots only sporadically came across as a bit murky. They usually appeared reasonably clear and smooth. Contrast also seemed solid, as the movie exhibited a nice silver tone. The transfer�s main concerns came from source flaws. A mix of specks, lines, marks, grit, reel change markers and blotches cropped up throughout the film. Though they never seemed terribly heavy, they were a frequent distraction. All of this made the transfer good enough for a �C� at best. The situation didn�t improve with the relentlessly mediocre monaural soundtrack of 12 Angry Men. To call this an unambitious mix would be an understatement. The track offered very little score, and effects were essentially restricted to the creaks of chairs and the bumps of closed doors. Both sounded acceptable, though they generally were rather thin and without much range. Speech accounted for every important aspect of the mix. At all times, the dialogue was intelligible, but I thought the lines tended to be tinny and a little sibilant. There was a slightly problematic thinness to the lines that made them somewhat unappealing. I noticed a little background noise at times, but the track usually seemed clean. Overall, this was an average piece for a 50-year-old film. Despite its status as a classic, Men skimps on the extras. We get the movie�s trailer but nothing else. After 50 years, 12 Angry Men occasionally shows its age. However, it succeeds much more than it falters, and it remains a gripping piece of drama. Unfortunately, this DVD leaves a lot to be desired. It suffers from flawed picture and audio and leaves us without any substantial extras. I think the movie deserves your attention but find it hard to recommend this problematic DVD.